I’ve arrived, I’ve somewhat settled in, I’ve had a whirlwind experience of selected shore fishing and it’s been good. The preparation for moving to a tiny place started in Perth where I boarded a baby propeller plane bound for Learmonth Airport, Exmouth. On arrival I had to somehow make it to town, something I hadn’t bothered to look into or to plan as these things can usually be worked out at the airport. First lesson learned; always carry cash in Exmouth! The man for the shuttle bus abruptly informed me he doesn’t take eftpos but would give me a lift to town via an ATM which was alright apart from the first one we stopped at wasn’t working. Fortunately he was patient enough to take me to another and we sorted it out. Welcome to small town living. The next day I awoke early with all intentions of going fishing but first I needed to tie up some flies. I stopped off at Fly World in Perth, a superbly stocked fly shop with a great owner. Chris is very friendly and will keep you interested as you search around his little gold mine. There isn’t a huge floor space but it is the single best fly shop I’ve ever visited. Nearly everything you could imagine and all in stock, none of this out-of-stock nonsense you get a lot in the UK. I’ve just gone and realised I’ve deleted the photos of the shop, dammit! Some clousers tied and off fishing I went. 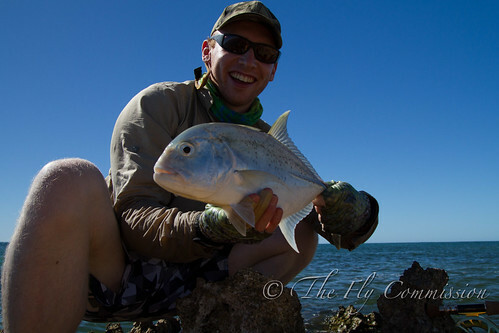 I fished the next two days just around the town beach and picked up a couple of small giant trevally (GTs). These fish were not big by any stretch of the imagination but I can assure you they would tow a large trout backwards in a tug of war without putting in much effort. It’s just incredible. 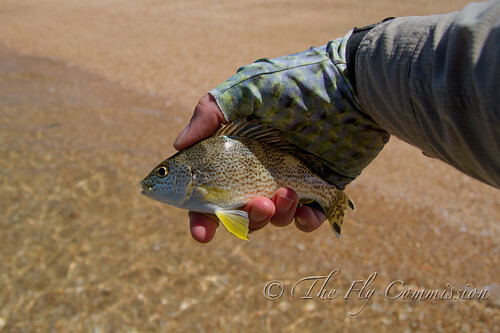 I couldn’t believe the size of these fish when I finally saw them, saltwater fish are turbo-charged! On Saturday I was fortunate enough to get a lift up to Ningaloo Reef with a couple of Aussie girls I met at the backpackers. 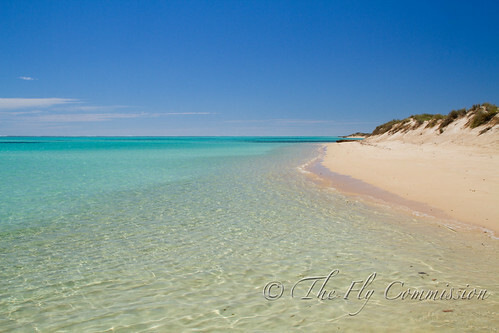 They planned snorkel the Mildura wreck so lacking any snorkeling gear I went for a walk then a swim in the shallows. Not much to report from here but I did get to fish a bit in the afternoon and picked up a couple of Queenfish and some more Trevally. Again nothing big but great fun and more species added to the list. 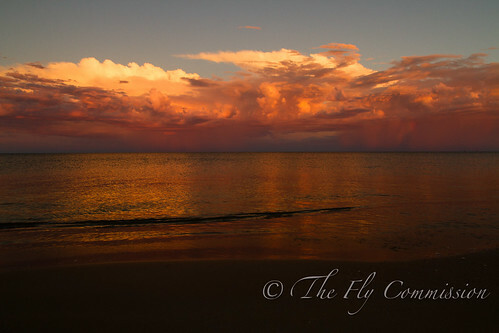 That night I met up with the Boneheads group, a club of Western Australian fly fisherman on their annual trip. 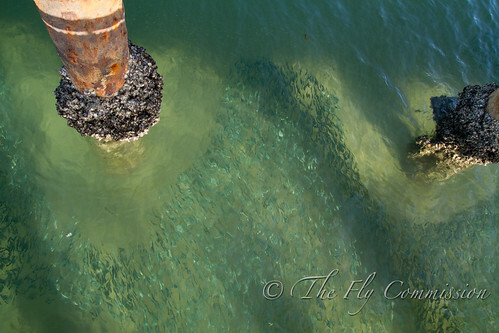 They warmly welcomed me in and I’ve been fishing with a few of them for the past 4 days. We haven’t had any real fish of note to report but I have managed to explore a lot of coastline and starting to draw a limited picture of areas and tides. It’s all a learning curve so at the moment it consists of getting out and fishing, writing down the area, the tide and observations on access and fish. Hopefully in time it will come together to open up an understanding of the fishing. Sight fishing is coming together nicely. There’s certainly a lot of carryover from my trout fishing but the difference is in trying to identify what it is you are seeing. 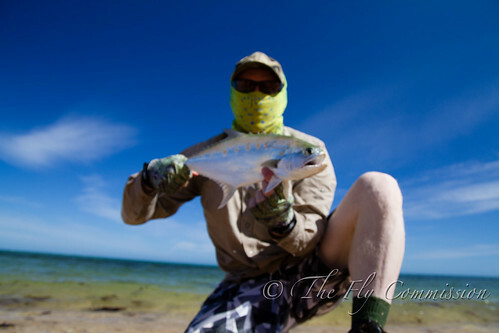 If a permit swims past there is no use chucking a deceiver at it for example. I’ve sight cast a few of the little trevallies and had one shot at something big. 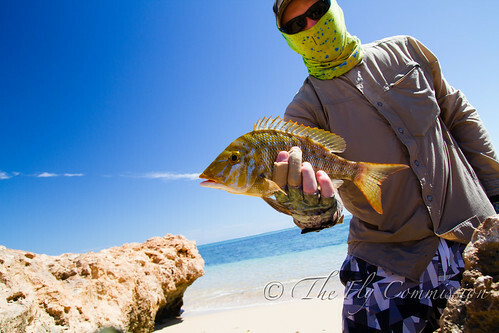 I was walking along the shoreline, spotting as I went with Matt fishing into some likely looking water just behind me. It is fairly common to spot big rays cruising along and sharks too and I have been told there are often fish hanging off the back of these feeding. I spotted a large shadow, immediately noted as a fish and not a ray or shark, coming straight at me along the shore at a reasonable fast rate. I jumped down, stripped line off my reel like a maniac and managed to get the fly in front of it by about 10′ as it swam past. It sank down and I started stripping. 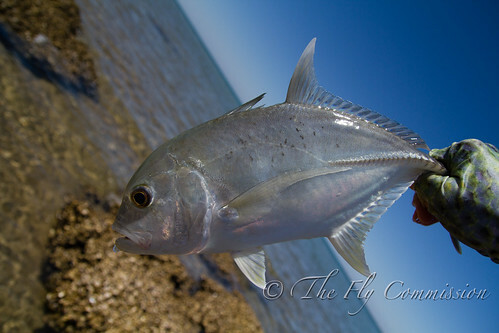 It charged the fly before turning and bolting off spooked towards the reef. 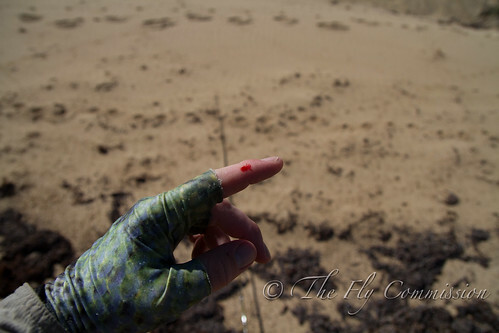 I was left a bit shocked with my heart thumping and some swear words ringing out along the beach. 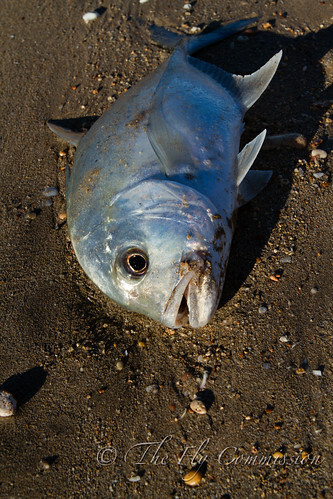 Coming from a trout background I hadn’t appreciated that a saltwater fish would spook to the same degree when things aren’t quite right. It was an eye opener. I truly wish that had hooked up, I don’t know what it was but it was a bloody big fish. Nevermind, there will be more and I am going to find them. Oh, we found some bonefish too. I’ll certainly try and get a crack at them over the next 6 weeks although boat access definitely seems easier as they are often in deeper water. Those little Queenies have some seriously sharp spines! Well done Scott. The fishing looks fantastic and I am soooooooo jealous as I write this message from my hotel room in Riyadh. See that you are up to your old tricks trying to avoid paying for a bus ride!! I enjoy reading your blogs. Keep up the good work. Thanks, the fishing is definitely not easy and there’s a lot to learn but hopefully it will all come together soon! So interesting, Scott, what an amazing experience and you certainly are making the most of it. Loving the photographs…keep them coming! It’s been great thus far! Will certainly try to keep it all going, there’s a lot of things I haven’t photographed yet like the hundreds of turtles in the sea, the parrots around camp or the emus and kangaroos walking on the street! !